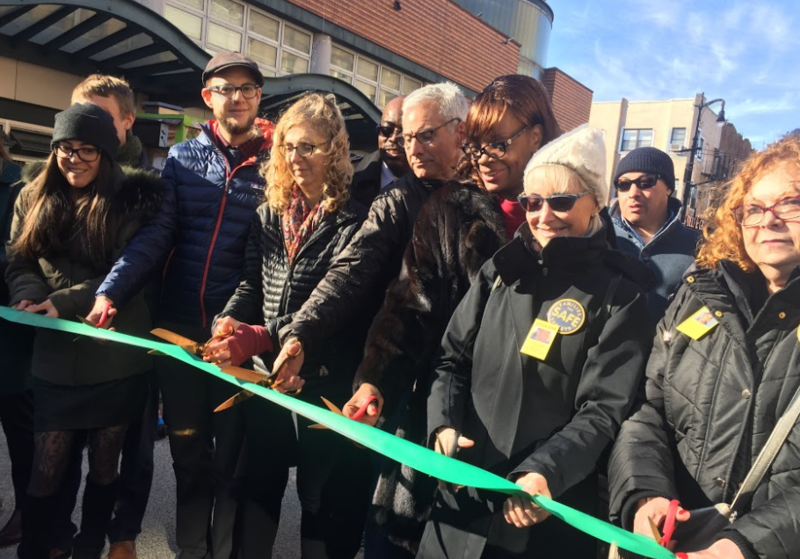 Members of Families for Safe Streets and DOT officials celebrated the completion of a new pedestrian plaza at the Myrtle-Wyckoff transit hub this morning. 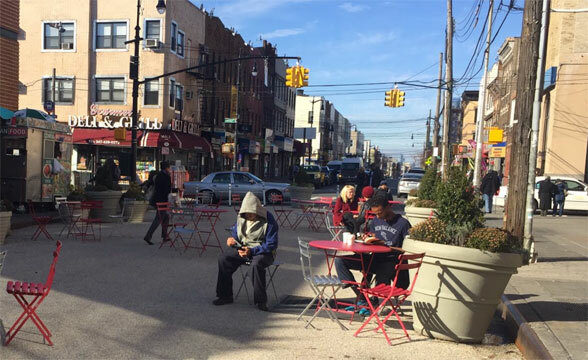 The plaza, on the block of Wyckoff Avenue between Myrtle and Gates, is the centerpiece of a major safety project that will reduce conflicts between drivers and pedestrians at an intersection where three people were killed by motorists since 2009. 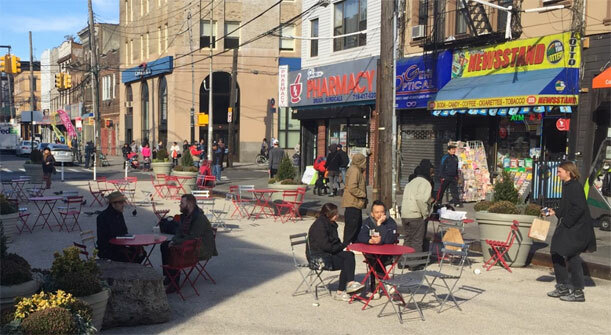 The installation of the plaza marks the culmination of a multi-year effort to fix the six-way Myrtle-Wyckoff intersection, which is the access point for two subway lines and six bus routes. Before the plaza, pedestrians, who outnumber motorists 3 to 1 during peak hours, were squeezed onto the margins. Now people can walk freely between the subway and the bus. Judy Kottick, third from left, cuts the ribbon on the new plaza. The plaza also greatly simplifies complex turning movements that had jeopardized people’s lives. After an MTA bus driver killed 23-year-old Ella Bandes in 2013, DOT made some adjustments to eliminate some turning movements, but the changes were not enough to prevent another turning MTA bus driver from killing Edgar Torres the following year. About 200 people attended a January 2014 vigil in memory of Bandes. Soon after, her parents, Judy Kottick and Ken Bandes, joined other people who had lost loved ones to traffic crashes to form Families for Safe Streets. 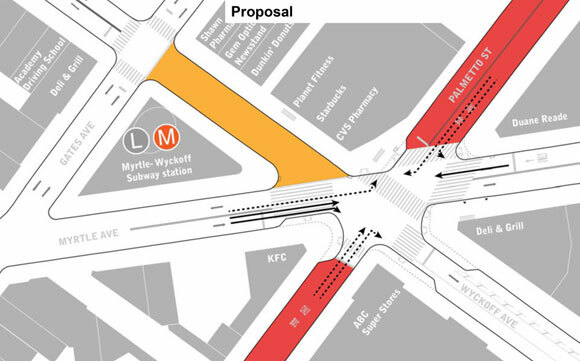 Combined with bus-only blocks on Palmetto Street and the one-way conversion of one block of Wyckoff, the new plaza cuts the number of potential vehicular movements at the intersection from 25 to eight. “Simpler is better, simple means safer,” said DOT Queens Borough Commissioner Nicole Garcia. “It creates a much safer and welcoming place for the entire neighborhood.” Garcia said the plaza, currently installed in temporary materials, will be built out in concrete in 2020. Over the summer, the project won the support of Queens Community Board 5, which represents the eastern side, but was overwhelmingly rejected by Brooklyn Community Board 4. Council Member Antonio Reynoso urged DOT to move forward with the project despite that vote. CB 4 chair Julie Dent said she had personally come around to it. “This is a wonderful, wonderful initiative,” she said.